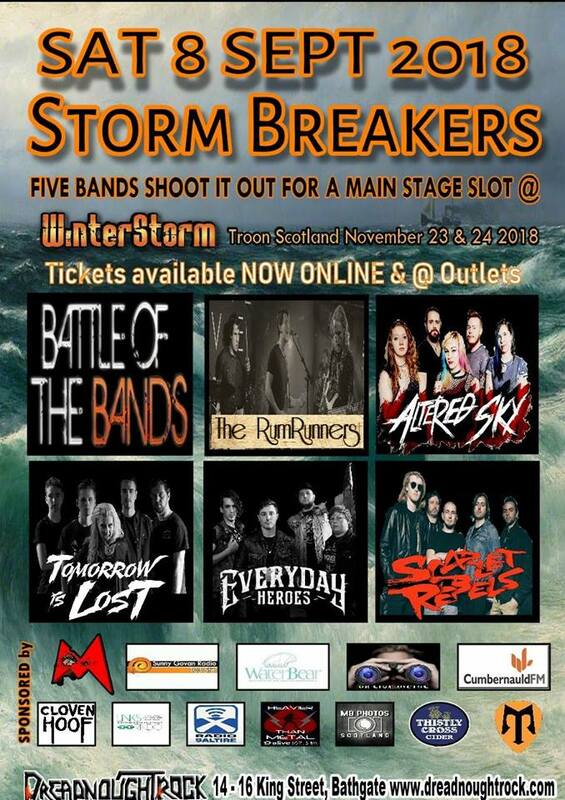 Now in its second year, StormBreakers sees several bands perform live in front of a crowd and panel of judges at Bathgate’s Dreadnought Rock to secure a place at this year’s Winter Storm in November, following in the footsteps of last year’s inaugural winners Anchor Lane. With the running order not revealed until the night itself, we’re bringing you interviews from all the bands set to take the stage to give you a hint of what to expect on the night. If you’re planning on attending StormBreakers, we hope you make a new discovery or two, even if they don’t take home the coveted prize. Tomorrow is Lost, much like a few other bands taking part, have featured on our pages before so let’s see how they handle the latest variation of our #RoadTo… questions. Myself (Cass), Joe, Marc and Adam are from Newcastle, and Ryan is from York. We formed back in February 2017, but I would say that the lineup didn’t sort of solidify itself so to speak until Marc joined us in around May 2018. It’s been a bit of a crazy start for us – but they say everything happens for a reason, and I’m pretty confident that the band is exactly as it should be now. We only had two rehearsals before we our first gig (which sounds more and more ridiculous every time I say it), and at that point we didn’t even have a name…so in a bit of a panic we plucked ‘Tomorrow Is Lost’ from a line in one of our songs… and 18 months later – here we are! We’ve been described as being “raw” a lot and while I can never be quite sure how that’s intended – I always take it as a compliment and I suppose what I can say about our music is that it’s very honest. We’re not trying to prove anything, we don’t have any sort of agenda, we aren’t trying to reinvent the wheel… we’re just five people making music who have been fortunate enough to have been given some fantastic opportunities. We’re very lucky, and we’re having an absolute wicked time. What’s your live show like? How are you hoping to impress the judges? Have you been to Winter Storm before? How/when did you find out that you’d be playing StormBreakers? It was quite a while back now, I think it was Mark that sent us a message saying we had been invited to play. Really looking forward to playing the Dreadnought again to be honest, it’s a fab venue. Other than yourselves, who are you most looking forward to watch perform at StormBreakers? Scarlet Rebels and Altered Sky. What’s been the highlight of the band’s career so far? Our single launch party for “Insane” will always be a personal highlight for me. I remember just how nervous we were about putting on a headline show and just how hard we worked in the run up to the gig but we actually ended up selling out that show – which was a proper amazing feeling; and nothing could have prepared us for how well received the release would be. Maybe we’ll find out on Saturday! What are you working on at the moment/your plans for the rest of the year? We’re working tirelessly on new music, and we’re very excited for everyone to hear what we’ve been working on and aside from that – we’re busy prepping for a crazy run of gigs throughout October and November which we’re all really buzzing for.